How to reborn and add Stats on web? After 500 players reach max Reborns cap, we will increase cap +10. How to get 14dg items? 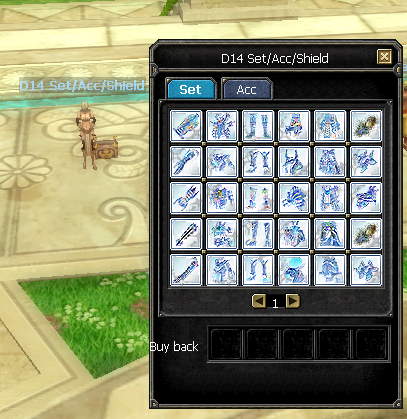 Set, Accessories and Shields can be purchased from Shop area. Bound Weapons (untradeable) from Event NPC in Shop area. 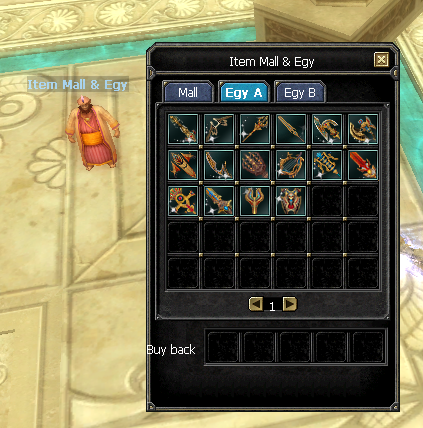 +30 Egy Weapons and Shields for 10k Silks at Item Mall NPC in Shops Area. IMPORTANT!!! Teleport after you buy +30 Egy Weapon or Shield, otherwise +30 will not be added. Clean Weapons you can get with quest "Sea of resentment collection" from General Senmute in Alexandria. How to SELL/BUY silks in game? We have in game at "Silk Item Scroll" NPC (Jangan and Shop Area) 25000 (25k) and 100000 (100k) scrolls that you can buy and trade with players. Right click to activate! Silks will be delivered in 5-10 seconds after using. Cant log in game - C2,C5,C7,C8,C9,C10 errors? Most frequent errors you may encounter. Mbot questions and support? How to add Letters to mBot! Click to go Forum - mBot & Setup Guide. Please do not email or create ticket support with BOT issue, only on forums. How to add Letters to mBot! 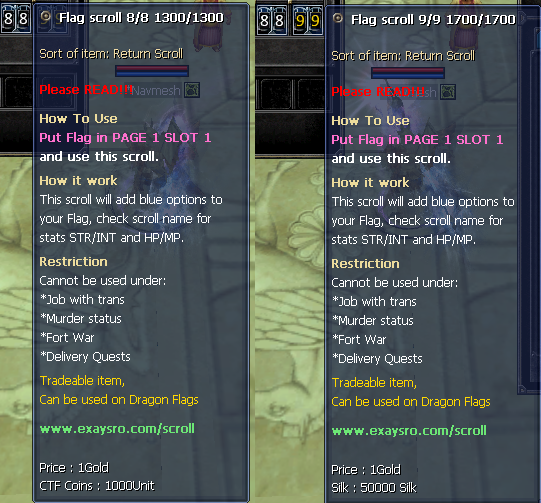 How to get Dragon Flag and blue stats on it? This is one time quest, one char can do it only once!!! 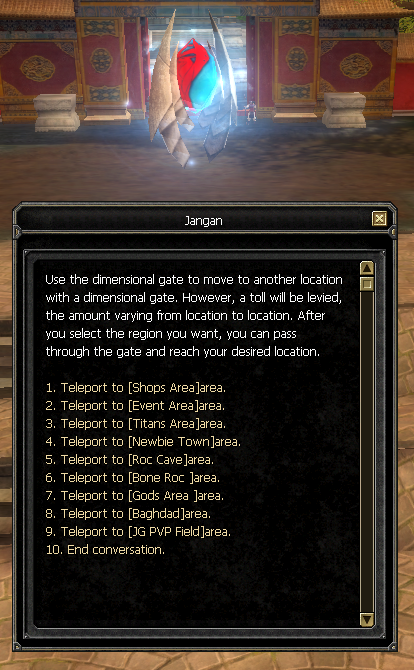 Buy Dimension hole from "Event NPC" in Shops area (just 13 golds). Talk with NPC "Hunter Associate Ahmok" from Hotan. Choose quest Nr.9 "The Burning Abyss Collection". Collect all 8 Talismans and you will be able to get Dragon Flag (Male or Female at your choice). 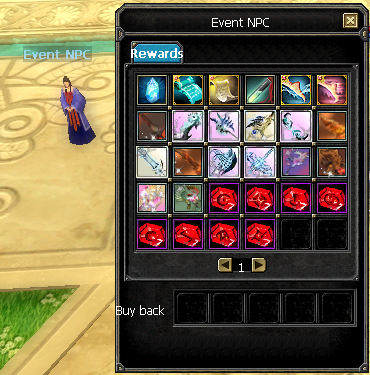 Right click talismans to register them, after all 8 registered go back to NPC to receive your Flag. To get stats on Flag, you need to teleport after receive it from NPC. For higher stats you can buy Scroll for Silks or CTF coins (event NPC). How to get silks for FREE? How to go to Shops arena (or some of other areas)? What are JC and what are they used for? JC is our currect currency system in ExaySro. 1 JC = 2bill gold, So 10jc = 20b bill and so on. You can also sell JC to other players for Silk. To be exact currently 10JC = 100 Silks to avoid scam and overpriced. JC can also be obtainable if you do Daily Quests in Newbie town. 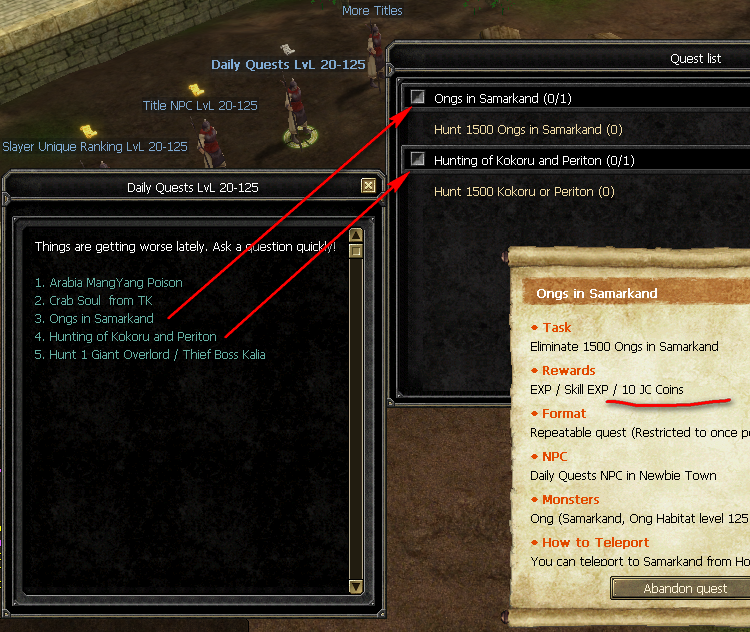 "Ongs in Samarkand" and "Hunting of Kokoru and Periton" will give 10 JC each every day. After that just teleport or change map and your item will be +30/+35 no Advanced. Trying to do alchemy without teleport or map change, will result in fail to get +30/+35. Just buy and teleport or NO refunds will be given!!! For example you have CharA with 100 reborns and want to transfer them to CharB with 10 reborns. * To request this email at: exaysro@gmail.com or send a PM in Telegram. How to do Weapons & Shields +45 100% Stats with Scroll for Silks. 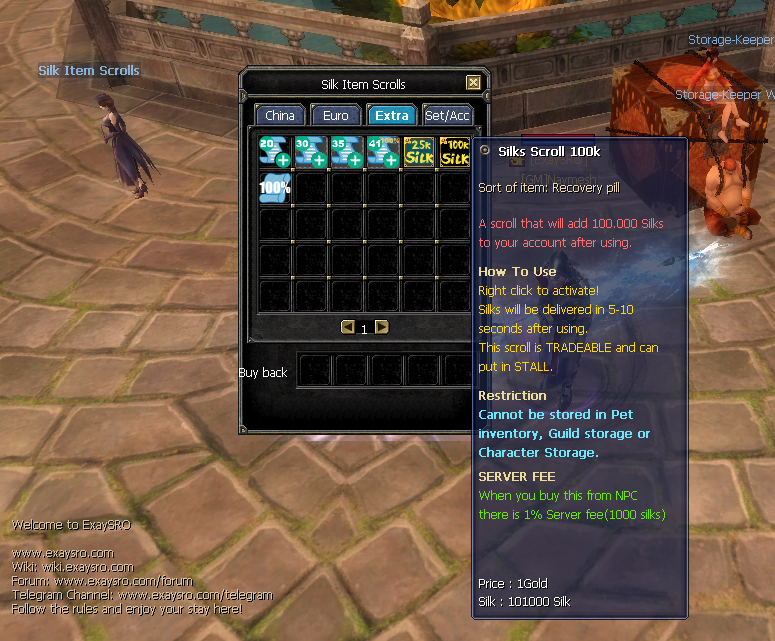 You can buy this Scroll for 250.000 (250k) Silks from "Silk Item Scrolls" NPC in Jangan or Shops Area. after teleport your item will be +41 NO ADV (or +45 if AdvD is in use) and 100% Stats. 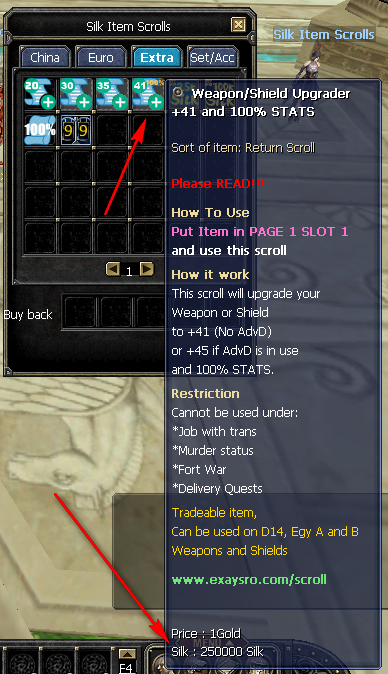 This Scroll can be used on D14, D14 Event, Egy A & B Weapons and Shields only.